My four-year-old son is not big on breakfast. We’ve struggled to find a food that inspires him to eat in the morning. During the week, I’m gone before he gets up, but I was able to persuade him to eat a pancake some weekend mornings. When we could find bacon on sale, we might add that to the pancake breakfast. He developed quite a taste for the bacon. It’s rare that I can sell a pancake without bacon anymore. The last time we had bacon, we were all sitting around the breakfast table, discussing his upcoming birthday. “I think I want bacon for my birthday,” the boy declared. “I want bacon instead of cake.” His mother and I like bacon too; if he wants us to spend the cake money on bacon, that’s fine with us. We shrugged and said it was okay. That must have seemed too easy, so he made sure we understood. “The bacon is instead of cake. It’s not my present.” Bacon is delicious, but it’s still only food. Food is not an appropriate birthday present for a boy who has seen the wonders housed within the magical walls of Toys R Us. I suggest that he wish for a significant price drop in the pork belly futures market. I hope he wasn’t envisioning his birthday party as a black tie affair, because bacon and ice cream don’t really wear well on a tux. Besides, if he wants to look like a junior Orville Redenbacher, he’s going to have to finance that fashion statement on his own. At the end of our shopping trip, we passed through the bakery section of the store. The boy stopped and gazed through the glass at all the sweet treats. 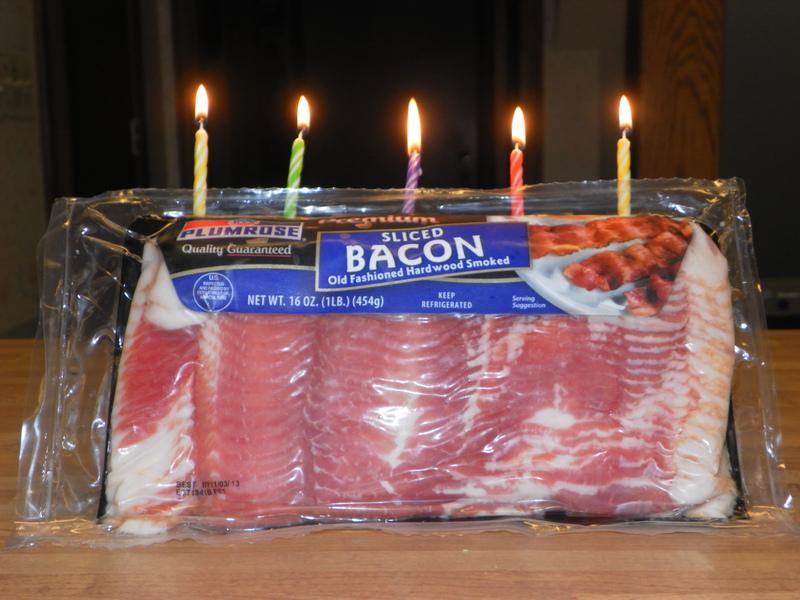 “Well, I think I do really want a cake instead of bacon for my birthday,” he said. “How about a cake shaped like bacon?” his mother asked. Oh well. Bacon was starting to sound good, but I like cake too. This entry was posted in It's a Guy Thing and tagged Bacon, children, Dads, family, fatherhood, food, humor, kids, parenting, Sons. How about bacon flavoured cake?? Now you’re just toying with my emotions. Normally, I wouldn’t mind. But this is bacon we’re talking about. That is too funny. He’s a smart one – knows what he wants. Plus, you gave me an idea. My husband would drool over a bacon “cake”, such as the one you have pictured above. Cooking the “cake” might be a good idea too, at some point. But I haven’t gotten that far yet. True. It would taste much better that way and lot less chewy. And nobody wants a chewy cake. That kid must be part Homer Simpson. There’s a little Homer Simpson in us all, Tom. Maybe I’ll look for some egg flavored ice cream for the bacon cake. If I had a nickel for every time I’ve said that exact thing . . .
A bottle of this product might be handy: Bacon milkshakes, bacon flavored pancakes, bacon syrup on spam, or just a teaspoon of bacon after breakfast has been finished. Great idea, but does it have all the pig fat my family needs for a healthy diet? This made me chuckle because I just had a birthday, and I chose a pecan waffle with bacon for my birthday supper (the night prior to was the real celebration). But to be clear, I didn’t wear a bow tie at either event. I’m sure the bow tie would have looked fetching on you. Hope you enjoyed your waffles and bacon, and your birthday. My son has a very limited diet, but bacon makes the short list. Lately, however, he has taken to eating pepperoni for breakfast. It all evens out because he eats cereal for supper. You could probably make good money off it if you developed a pepperoni cereal. I’m not sure how you have the meat stay crunchy in milk though.